The viscosity of a liquid is a measure of the difficulty which molecules have passing each other in a fluid. It is dependent upon the size and shape of the molecules and by the magnitude of the cohesive forces and intermolecular bonds such as hydrogen bonding. Spherical molecules have less flow resistance than long molecules which can become entangled. Very viscous liquids tend to be long chained molecules. 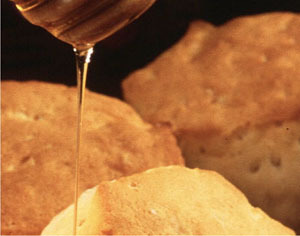 For example, honey has a much higher viscosity than water. Viscosity is highly dependent on temperature, decreasing with increased temperature. Why is honey more viscous than water? Honey is a mixture of primarily of fructose, glucose and water and with the remaining ingredients composed of various saccharine, organic acids, minerals and enzymes. Honey in part is more viscous (thick) than water due to strong inter-molecular forces. However in addition the structure of glucose, fructose and other saccharine are large in size compared to water molecules and can become entangled. Viscosity describes how a fluid resists forces, or more specifically shear forces. Shear is the type of force that occurs when two objects slide parallel to one another. Fluids with low viscosity have a low resistance to shear forces, and therefore the molecules flow quickly and are easy to move through. A fluid that has no resistance to shear stress is known as an ideal fluid or inviscid fluid. Zero viscosity is observed only at very low temperatures. Otherwise, all fluids have positive viscosity, and are technically said to be viscous or viscid. However, a liquid is said to be viscous if its viscosity is substantially greater than water's, and may be described as mobile if the viscosity is noticeably less than water's. If the viscosity is very high, the fluid will appear to be a solid in the short term. The SI physical unit of dynamic viscosity is the pascal-second (Pa·s), (equivalent to (N·s)/m2, or kg/(m·s)). A shear stress is defined as the component of stress coplanar with a material cross section. Shear stress arises from the force vector component parallel to the cross section. shear rate = velocity of the moving plate, measured in meters per second/ the distance between the two parallel plates, measured in meters. The units are expressed in centipoise (cP), which is the equivalent of 1 mPa s (millipascal second). Isaac Newton, the man who discovered the above formula, thought that, at a given temperature and shear stress, the viscosity of a fluid would remain constant regardless of changes to the shear rate. A non-Newtonian fluid is a fluid whose flow properties differ in any way from those of Newtonian fluids. Most commonly, the viscosity (the measure of a fluid's ability to resist gradual deformation by shear or tensile stresses) of non-Newtonian fluids is dependent on shear rate or shear rate history. There are five types of non-Newtonian fluids: thixotropic, rheopectic, pseudoplastic, dilatant, and plastic. Different considerations are required when measuring each of these fluid types. See Types of Non-Newtonian fluids for more details. Many commonly found substances are non-Newtonian fluids, such as ketchup, custard, toothpaste, starch suspensions, paint, blood, and shampoo. Many commonly found substances are non-Newtonian fluids, such as ketchup, custard, mustard, whip cream and various food thickening agents. Non-Newtonian shear thinning is an obviously desirable attribute that allows a condiment to be delivered easily from a bottle (low viscosity at "squeezing" shear rates) and yet retain a rich texture on the plate (high viscosity at low shear rates). Contrast this behavior to the Newtonian flow of honey which necessitates a hard squeeze on delivery yet flows under its own weight. Why doesn't the viscosity of water change much with temperature like it does for other substances? 2. Why is honey more viscous than water? 3. Why is the understanding of viscosity import for the food industry. a) Many commonly found substances are non-Newtonian fluids, such as ketchup, custard, mustard, whip cream and various food thickening agents.